Ohav Shalom has a fully accessible facility located in a scenic, park-like setting, with beautiful landscaping featuring large green space, woods and dedicated areas for children that include an outdoor playground and an area for its childcare program. The synagogue is right off Rt. 85 near the Krumkill Road exit. 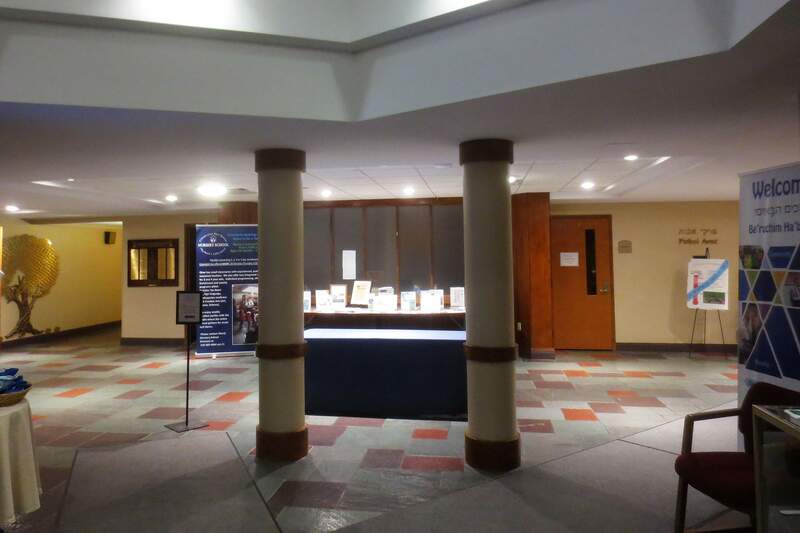 The synagogue has ample parking and is accessible by CDTA bus with about a 10-minute walk from the bus stop. Congregation Ohav Shalom is proud to be one of only 9 organizations across the United States to receive the Hazon Seal of Sustainability in 2018, and one of approximately 60 participating organizations from 2016-2018. The Hazon Seal of Sustainability provides a roadmap to advance sustainability-related education, action, and advocacy in the Jewish community and beyond. Synagogues, including Ohav Shalom, and some day schools, camps, social service agencies, Hillels, and other Jewish institutions have taken meaningful, measurable steps towards increasing their sustainability, and have been recognized for their efforts. Ohav Shalom takes the doctrine of tikkun olam – repairing the world – seriously. Through our Shomrei Adamah program, we are carefully scrutinizing what we do. We now utilize sustainable materials that have minimal or no environmental impact wherever and whenever possible. We continue to assess our carbon footprint, and have made serious changes to our facility over the past few years. For example, a few of the most recent projects include the 2017 replacement of all the original windows with 93 energy efficient windows in the classrooms, administrative offices and kitchens. In 2017, Ohav also installed a new, white membrane on the roof specifically chosen to repel the sun’s rays. During the summer of 2018, new energy-efficient air conditioning units were installed in classrooms enabling us to have dual choices of air conditioning or heat and providing Ohav with the option of not having to turn on the heat for all class- rooms at the same time, resulting in significant energy savings. Several years ago, Ohav replaced its lighting fixtures and installed 325 LED light bulbs. Most recently, Ohav has undertaken an initiative to recycle our food and other waste including paper and plastic. Foam and plastic products have been drastically reduced and eliminated where possible. If you look around our synagogue you will notice several important items: a recycling station by the office to encourage recycling and single-stream recycling bins in every classroom. We have also conducted Zero Waste Shabbat programs, and instituted a recycling plan. In the summer of 2018, thanks to our Zero Waste Shabbat experience we diverted 780 pounds of waste from landfills! The synagogue is adding Shredding Days to assist our congregants by providing an environmentally sensitive method of disposing of their confidential documents safely. Click here to learn more about Shomrei Adamah. Ohav Shalom has also entered into a partnership with FoodScraps360 so that we can efficiently and effectively manage and share our compost with local farmers. In our very first Zero Waste Shabbat experience on June 9, 2018, we were able to divert 170 lbs. of waste from the landfill. The average individual who follows these procedures in their home will be able to divert about 230 lbs. annually. We at Ohav Shalom are mindful of changes in our society that sadly make the safety and security of our congregants an even more crucial aspect of our synagogue lives. With antisemitism on the rise, and mass shootings occurring in the United States more often, we have considered the implication on the safety and security of our shul. We want to assure you that the leadership of Ohav Shalom is always mindful of the need to strike a balance between maintaining the sanctity of our shul and the need for safety and security. We continue to work with law enforcement to determine that best course of action for our shul. We are developing short -term and long- term options. The need for police presence will be evaluated on an ongoing basis. That said, we need your understanding and cooperation to make our safety and security steps effective. OUTSIDE DOORS – The doors to the building are kept locked. A code will be required for entry. We know this may pose an issue for some individuals coming to morning Minyan to say kaddish or observe a yahrtzeit. If you know in advance that you will be needing access, please call the office for a code. ACCESS CODES for entry into the building have been changed. If you had been using a code for access and have not received a new code, please call the office as soon as possible if you need and qualify for one. PLEASE DO NOT GIVE YOUR CODE TO ANYONE ELSE. GREETERS – We have been advised by law enforcement that having greeters should be a priority. We have implemented a Shabbat Greeters program for the front door on Shabbat. This will include greeter training. We cannot implement this step without YOUR involvement. Please consider signing up to be a Greeter on Shabbat morning. Members, please contact the Ohav office for the link to sign up to be a Greeter. NO TAILGATING PERMITTED – Please do NOT prop open any door or let in people you do not know. SINGLE ACCESS POINT – We have been advised to follow the practice of limiting access to our building by using a single point of entry and exit. Please use the administrative entrance (the middle glass doors) during the week for entry and exit. We understand this may be an inconvenience, but we have been advised that this is essential. TRAINING – Please look for notice of education and training programs that we will be offering to the congregation around safety and security. MUM’S THE WORD – We also have been advised not to publicize the details of every security measure we implement. So, if you’re in the know, please keep your knowledge to yourself. PLEASE OBEY THE RULES – Please do not use your judgement as to when and whether or not to bend these rules. There can be no exceptions to them. When you substitute your judgment for that of experienced law enforcement, you risk the safety of everyone in the building. As always, please share any concerns or suggestions with our President, Judy Avner or our Safety and Security Committee Chair, Ed Jacobs – security@ohavshalom.org. Our synagogue, located at 113 New Krumkill Road in Albany, New York, was built in 1964. The planners for the new building were determined to make it accessible so that all people, regardless of physical abilities, would be able to pray in our shul. The single-floor architecture not only met this goal, its sanctuary and social hall was designed as an interpretation of Noah’s ark and God saving the Jewish people. The simplicity of the design and interior decor purposefully creates an atmosphere of serenity and tranquility, all of which helps congregants separate themselves from their hectic, busy life to the calm and nurturing place of prayer. The same approach was used for the chapel, which is peaceful and serene, providing an intimate setting for prayer and connecting with our spiritual selves and with God. Designed and built specifically for this chapel, the rich, beautiful ark and yahrzeit cabinetry enhance prayer. During the 1980s, Ohav Shalom added a new wing to our building for educational purposes. The Early Childhood Education Center still occupies this wing during the day, and it is alternately filled with our after-school and Sunday Hebrew School education program. Upon entering our synagogue, one is greeted by a beautiful lobby that features a skylight to let light enter with you. Our main sanctuary features large, hand-made needlepoints made by members of our congregation. Our kitchen is a wonderful area to work in with enough room to prepare for any event held at the synagogue. Our large social hall is well utilized on a weekly basis and for special occasions. Our Junior Congregation meets in the Chapel weekly. The Cantor Dan Chick Library, which has a large collection of books of interest to our members, was dedicated in memory of our Cantor Chick in 2017.